I went shopping for maternity clothes a few weeks ago, and it almost ruined me. The plan was to go straight to Motherhood Maternity. However, my ego was feeling mighty that day, and instead, I opted to start my shopping at H&M. Five and a half months pregnant with my second baby, I was sure I could still fit into the same old sizes I used to wear (never mind that I was still making my way back into those old sizes since the birth of my son 14 months ago). I slid on a pair of jeans, but as I pulled them up around my waist, I stopped. The pants would not button. I felt my baby starting to push its way across my waistline, interfering with all hopes of wearing tight-fitting designer denim. With that one little hiccup, my entire reality became a distorted version of the truth. I hate being fat. I thought about going for an extra run to burn the calories, and I would no longer be treating myself to that Starbucks. Defeated, I folded the jeans and put them away. There were tears in my eyes as I left the store, because I knew what I had just done to myself. The eating disorder I had managed to tame for months was awake. Its voice rumbled in the back of my mind, slowly crawling to the front of my brain. It felt like someone heavy was sitting on my chest, pushing a lump into my throat. These feelings have been with me so long they have become a familiar, unwanted frenemy that I know by heart and am too tired to run from. Motherhood Maternity was packed with lots of other expectant women. All were smiling, touching their bellies and poking through the racks of clothes. I wished I could be like them. Instead, all I felt was dread and slight failure. I grabbed a pair of maternity pants and went into the dressing room to try them on. Some women love them; I am not one of them. When I have them on, all I can remember is the fat girl I used to be. At my heaviest, I was 285 pounds. I suffered from bulimia and food addiction. A lifetime of different types of abuse had led me to seek refuge in food. I ate every time I felt an emotion. And I hated myself; it was a hamster wheel I could not escape. Self loathe, eat, self loathe, eat, and repeat. One day, I decided to make a change. I lost 134 pounds over a year and a half period, the right way. I exercised five days a week, ate immaculately, and meticulously logged every single morsel I put into my mouth. During this process, I unknowingly traded one disease for another. 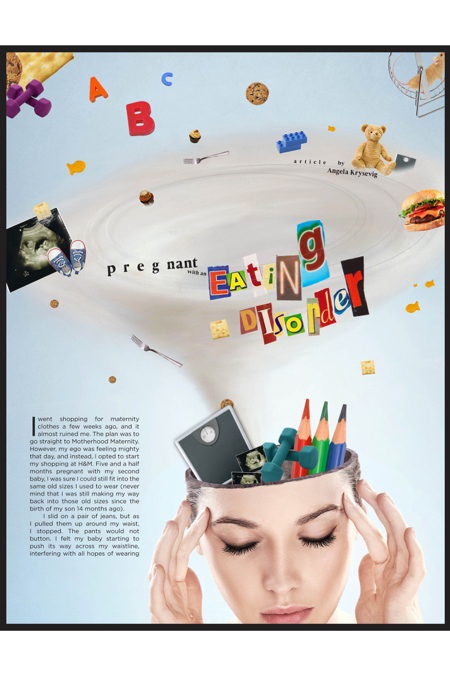 Bulimia took a backseat to anorexia nervosa. This is a type of eating disorder in which a person has an intense fear of gaining weight. They severely limit the amount of food they eat and can become dangerously thin. This was my life. I couldn’t relax. I was obsessed with working out, and if I ate anything “bad,” it would destroy me for days. Finally, after a lifetime of trying to do this on my own, I went to therapy. With help, I got all issues under control. I had tamed the beast. As my belly grew, all I saw was my former self coming back. With each larger size outfit that I bought, I felt like a failure. I thought when people looked at me they only saw a fat girl. I was convinced at times that I didn’t look pregnant, just overweight. I felt guilt and shame, and I never spoke to anyone about my feelings for fear of being perceived as vain. No one wants to be “that girl.” And let’s be honest, there are so many women with conflicted body images, it is hard to discern who needs a compliment and who needs help. I didn’t want to be mistaken for the former. My eating disorder robbed me of a beautiful experience in my first pregnancy. I didn’t enjoy the process of being pregnant. Instead, I obsessed over exercise and food and counted down until it was over, for the sole purpose of “being pretty again.” Even when I think back on it now, I feel shame. I am ashamed that I let this win—that I wasn’t strong enough to overcome it. I am ashamed that I did not appreciate or enjoy the fleeting time I had to experience my son growing inside me. There are women in the world that would die to be able to carry their own child, and I am ashamed that I did not appreciate the gift I had been given. I really did try. It was a constant battle, and at times, there wasn’t room in my brain to think of anything else. I vowed to learn from this first pregnancy and not take the next one for granted. Bringing it back to the dressing room where I stood in chest-high stretchy pants, the same feelings started to creep back. I went home and cancelled my date night with my husband. It was supposed to be our cheat meal, the one night of the week when I was allowed to not feel guilty or obsess. The exact opposite happened. I cancelled a relaxing night with my best friend for a night of compulsive worrying and planning on how I could stop myself from gaining weight. The whole week following, I kicked myself into overdrive. I watched my food and my calories like a hawk. Three days out of the week, I pulled two-a-days with my workouts. After all that, when I went for my monthly OB appointment, I had still gained two pounds! I told my husband this later that night, completely irate. He looked at me with a blank stare. Did you ever have someone put something so plainly that it shifts your line of thought into focus? That was it for me. That one little statement was like a bomb in my brain. I had been treating this pregnancy as though it was my obesity, something to beat instead of embrace and accept. In that moment, I realized for the first time in two pregnancies that I had zero control over what was happening to me. I was going to gain weight no matter what, but I did have the control to have it be a healthy amount. It is not too late for me to turn this pregnancy around, and I am determined to do so. Pregnancy brings different experiences to different women. There is a very real psychological shift in identity in addition to bodily changes during pregnancy, and that can be a real threat to women who struggle with body image issues. Women, in general, have satisfaction issues with their bodies, and pregnancy tends to amplify that in some. It is said that it takes a village to raise a child, but there also needs to be a village to support the mother. armywifeandmommylife.svbtle.com, which chronicles her experiences as a military wife and new mother.?? He Says, She Says: Are We A Couple?